Students will be introduced to a brand new vocabulary and will practice via the dialogue Method. Classes will incorporate vocabulary which is relevant to Israel lifestyle and culture. This level course will be based on the vocabulary and skills learned in level 1 with higher emphasis on reading and writing of the "Aleph-Bet". This level is suitable for students with an accumulate vocabulary of 100 words or more (vocabulary learned in level 1). Class in this level will use the dialogue method as well. In this level students will work to achieve a larger vocabulary to the point of being able to take part in a spoken conversation. Also, students will learn the basics of Hebrew grammar: building correct sentences, conjugation verbs, & tenses. This class will require a vast knowledge in Hebrew. 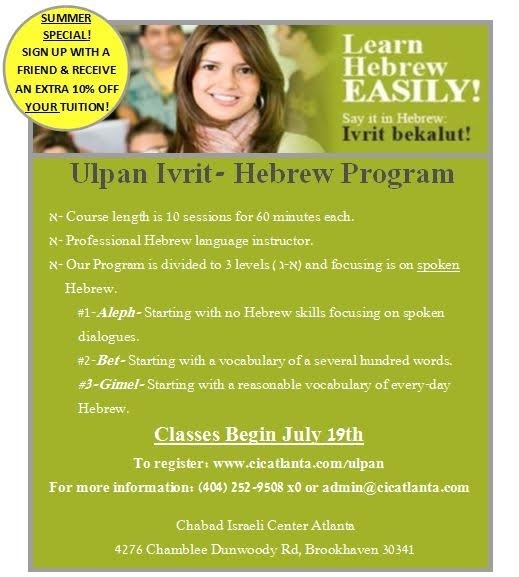 Our Ulpan program is a 10 week course, sessions are 60 minutes each. Ulpan tuition is $300.00 which includes registration, the course and all material. All classes will use the dialogue method to practice the learned material. This method helps the students to develop the needed confidence to advance in the language.